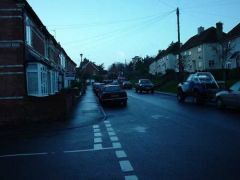 Harpsden Road is situated on the far side of the town and runs parallel to Reading Road. 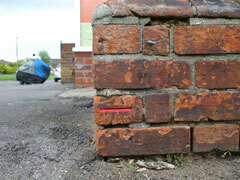 An Ordnance Survey benchmark carved into the wall of No.85 Harpsden Road (CMP Motor Parts). 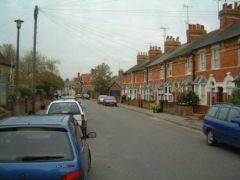 Traditional Victorian terraced houses that are situated along Harpsden Road. The road in the distance is Reading Road. A Traditional Victorian terrace house situated along Harpsden Road. 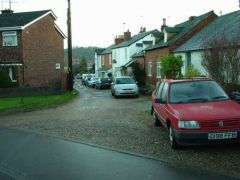 This view of Harpsden Road faces towards the village of Harpsden which is about half a mile away. 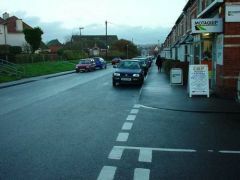 The junction of Harpsden Road with Niagara Road. Niagara Road joins Harpsden Road to Reading Road. This picture shows CMP Motor Parts which is located along Harpsden Road. This view looks towards Harpsden Road's junction with Reading Road. 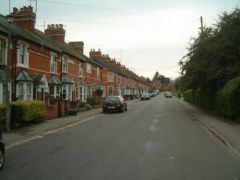 This picture shows Newtown Gardens. This small lane branches off Harpsden Road and runs parallel to Niagara Road.